If you don’t brush 4 minutes daily, twice a day. You don’t floss or go to a dentist for regular cleaning or deep cleaning. Then, better start using the electric brushes. The cost of any kind of tooth treatment is way higher than the cost of these toothbrushes. In a manual toothbrush, user personal brushing technique is important for cleaning the teeth. If the technique is not good then the plague or gingival inflammation is not removed effectively. In addition, the type of manual brush affects the cleaning. In an electric toothbrush, the brush makes rapid and fast bristle motion compared to a manual toothbrush. It vibrates at the speed which is higher than you can do manually and produce more brush strokes per minute. An electric toothbrush oscillates and rotates to clean the teeth. It is powered by a rechargeable battery which is charged through inductive charging using the base where the brush is kept. The electric brushes can be classified as Power, Sonic and Ultrasonic toothbrush. The classification is based on the frequency of the movements of the brushes. Power electric toothbrush produces strokes between 3,000 to 7,500 per minute. They either rotate in a circular motion or vibrate in forward and backward motion. They do not have many additional features. Sonic toothbrushes produce the rapid motion and produces an audible frequency of human range (20 Hz to 20,000 Hz). It produces 30,000 to 45,000 strokes per minute. Ultrasonic toothbrushes produce the wave at a minimum frequency of 20.000 Hz or 2,400,000 movements per minute. Ultrasonic toothbrushes produce vibrations with low amplitude and high frequency. These vibrations help to break up bacterial chains that are deposited as dental plaque on the teeth. Bristle type: Like manual, the electric brushes comes with soft, medium and hard bristle. In addition, the shape of the brush head varies too. It is your choice what kind of shape and type of bristle yourself, Generally, the soft bristle brush is good for teeth and gums. depending upon your need, you can choose round or oblong shape brush. Speeds and Settings: Electric brushes comes with various settings and speeds.The brush which can fulfill your custom needs are the best. Cleaning Options: Brushes comes with the cleaning modes such as sensitive, daily clean, whitening and tongue cleaning. Timers: Many electric brushes comes with timer, which alerts after 30 seconds and after 2 minutes. Either through beep or interrupt power briefly. It is recommended to brush at least 2 min and with a normal brush we often don’t brush that long. Timer helps you to brush each quadrant for 30 seconds and full mouth for 2 minutes. Battery Life: For most of the brushes, full charge lasts between 1-3 weeks. If you don’t have easy accessibility to charge at your sink top. With more battery life, you can still use it for quite some time and then charge it separately. Ease of Charging: Most of the models comes with some dock for charging the brushes. Power options supporting both 110V and 220V comes handy during International travels. 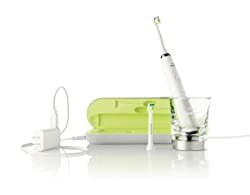 Models such as Sonicare Diamond Clean comes with a glass that also acts as a charger. If you can charge the brush using USB cable using your laptop that’s even better. However, this feature is only available in high-end models. Cost of the whole set: There is a wide variation in the cost ranging from ~$30 to $200. So, you choose what your need and end of the day you get what you pay. While checking the whole set also look what all is included in the package (Extra Brush head, Travel accessories, Number of brushes etc.). With accessories included even if the upfront cost is little higher in long run it turns out to be cheaper. Cost of replacement brush heads: Like Manual brush, the head of the electric brush needs to be replaced every three months. Thus, a recurring cost. While looking for brands, check what type of replacement heads they offer and the cost of replacing heads too. In addition, whether the base is compatible with other brands head too. This will help to avoid disappointments. Travel accessories: Travel case comes really handy while travelling. Also, if you get a mini travel charger that’s an added advantage as you don’t have to carry the bulkier dock along with you. However if your brush have long battery life you don’t need to worry much about travel chargers. Sanitizer: Few models such as comes with Brush Sanitizer. It’s not a must but a good feature. Color Options: Few brands offer color choices and few doesn’t. Look for it and you might get the color you want. Effective cleaning: The electric brushes comes with timers and other specialized features to make brushing more effective. Stain Removal and deep cleaning: Electric toothbrush strokes are way higher than the manual toothbrush and the small head goes to the places where a manual toothbrush cannot reach. The oscillating and vibrating movements can remove plaque faster. Safety: The electric toothbrush are safer to use. The energy spent on brushing with electric toothbrush is less compared to manual brushing. Prepare Kids for Dentist: Kids love brushing with electric brushes. It prepares them for cleaning with dentist. Cost: Though they are costly compared to manual brushes, they are quite effective. And, can save you from many tooth treatments. Sonicare DiamondClean is a high-end model costing around $190. It has following features that distinguish it from other models. Comes with 2 replacable brush heads. Slim ergonomic handle design for better grip. 5 cleaning modes – Clean, White, Polish, Gum and Sensitive. Battery life of 3 weeks. Dual charger – Glass Charger and USB Travel Charger. If you travel and feel that electric toothbrush are not handy. DiamondClean Travel charger will change your mind. 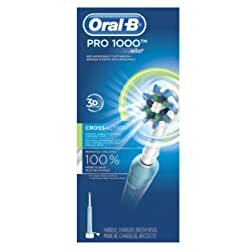 It is one of the latest and high-end model from Oral B.
Connects to the Oral B App on your smartphone to give real time feedback of your brushing. 5 cleaning modes- 3D Clean, Gum Care, Sensitive, Whitening and Deep Clean. Pressure Sensor Alert to let you know when you are brushing too hard. CrossAction round brush head for precise cleaning. Charging cable and travel case. No portable charger. 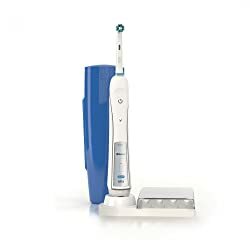 This is the best deal product from Sonicare. You get two sets of electric toothbrush for around $100. It may not have features like other high-end products. But, have enough to have a clean mouth. 2 minute timer with indication every 30 sec. Battery last for 2 weeks. Comes with charger and travel case. This is a budge electric toothbrush from Oral B. The other high-end models such as 7000,5000 and 3000 have more features compared to them. However, if you looking for an effective toothbrush with a budget price then you can go for this. 3D cleaning action, oscillate, rotate and pulsate to break and remove plaque. Pressure Sensor stop to indicate whether you are brushing too hard. You have lot of varieties and options in Electric Toothbrushes. We are trying to cover the main differences and features that will help you make a good choice.